I want to attract your attention to a marvelous functional doll from Zapf Creation — Baby Born — Mummy Pick Me Up. This lovely doll has got hair. 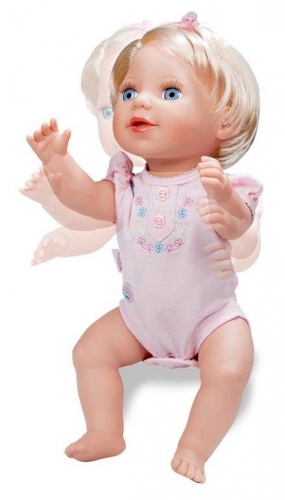 It differs greatly from the first dolls Baby Born by its functions: it laughs if you touch its cheeks, it kisses-smacks if it's touched on the lips and babble gladly. On making a special code more active, the doll is able to recognize its mummy, to ask for picking it up. You can watch this on video.